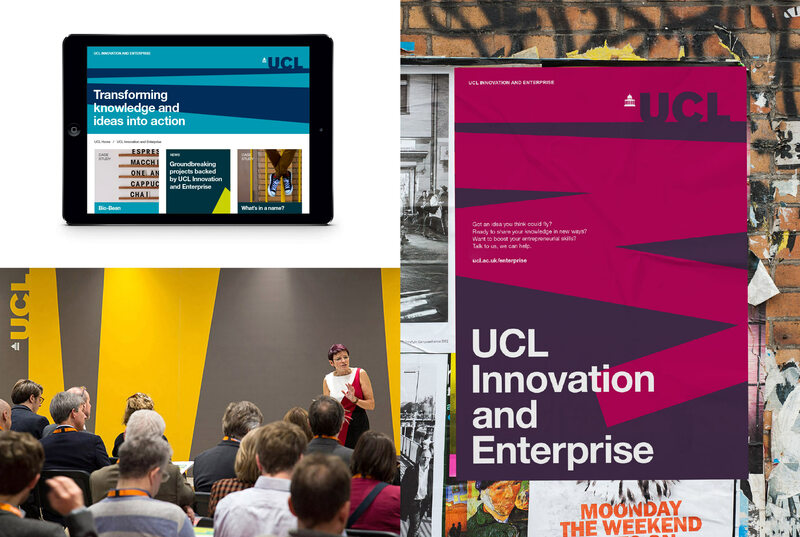 We were invited to join forces with the new vice provost of UCL Innovation & Enterprise to help establish a single, combined department that would bring together all of the university's enterprise-focused teams — from their tech transfer division to their consultancy wing, from student entrepreneurship to CPD and professional training. 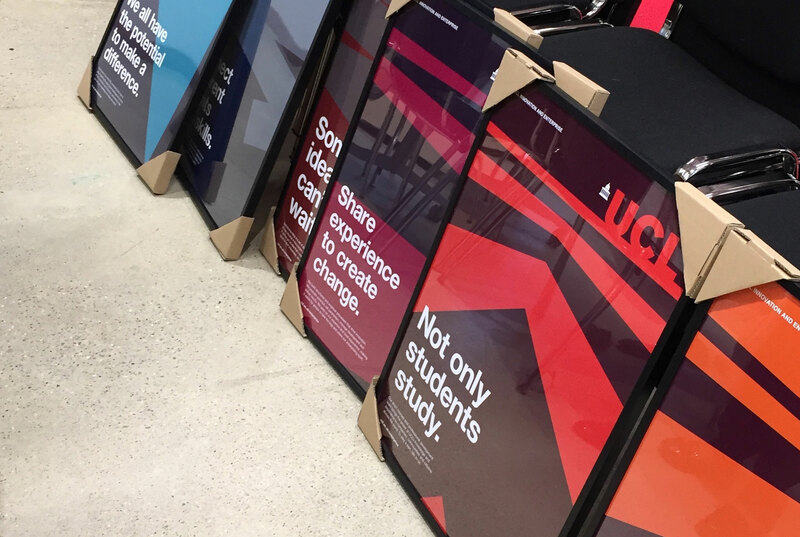 Our job was to define the positioning, the purpose and belief and develop a new visual identity that would give this new department its impetus and establish it as a credible and critical player in the university structure. The challenge was twofold. We needed to unite the newly formed team while also defusing the notion amongst the academics that Innovation & Enterprise was the ‘commercial exploitation’ team, there to make a quick buck off their hard work. 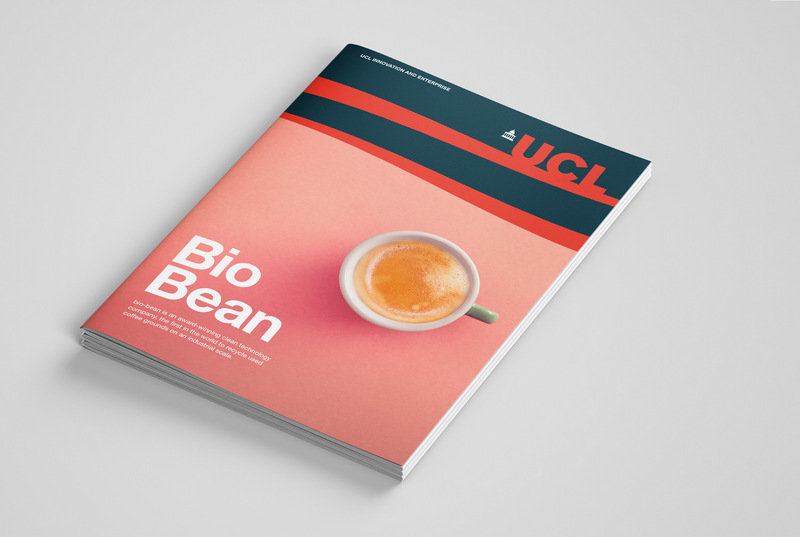 We connected the department's purpose directly to UCL’s vision: to use its research and knowledge to solve the global challenges of our time. This diffused any ‘them and us’ sentiment, focussing on the department’s role as a specialist enabler and activator. 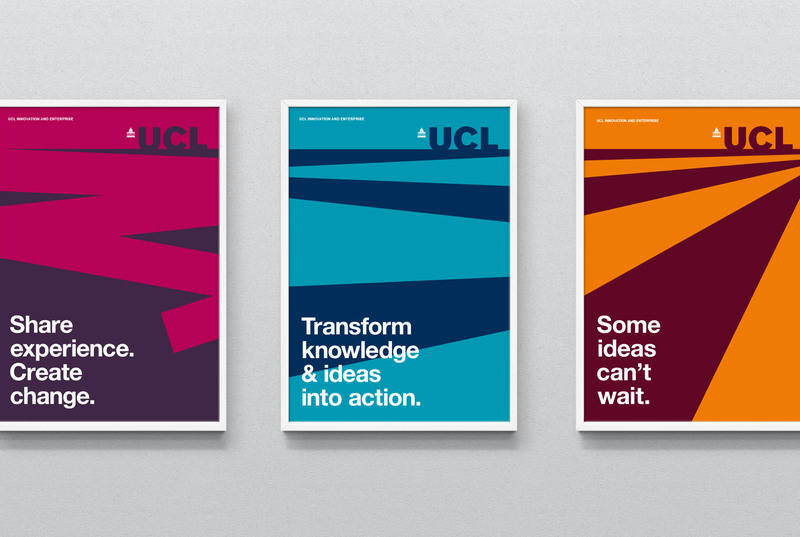 UCL was founded to open up education across all parts of society. We took this idea and turned it into a belief for the department, to show that being enterprising is also for everybody. 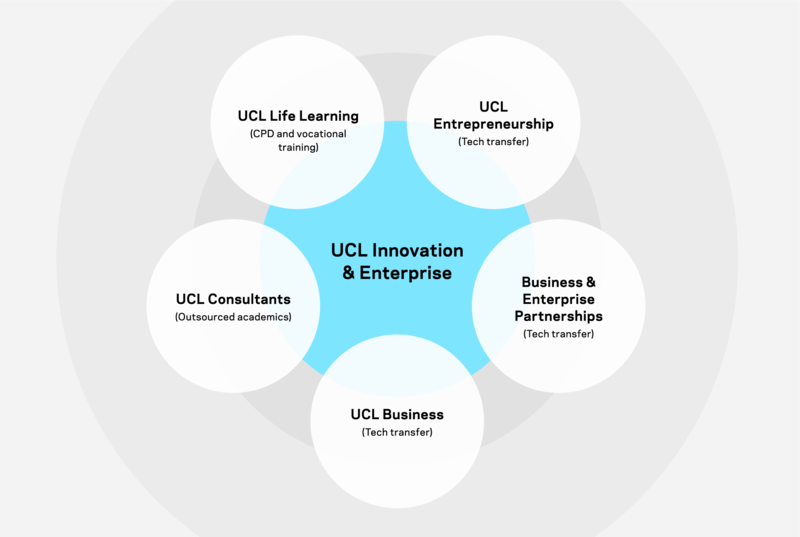 We are UCL Innovation & Enterprise, a group of specialist teams working with students and staff to encourage a spirit of enterprise, create links with the outside world and accelerate UCL’s innovation and impact. Our work is at the heart of UCL’s ambition to change the world for the better and it plays a vital part in our shared mission to tackle the great global challenges of our time. For us, it starts with the belief that we all have the potential to make a difference, that every one of us in the UCL community has a role to play and a contribution to make. 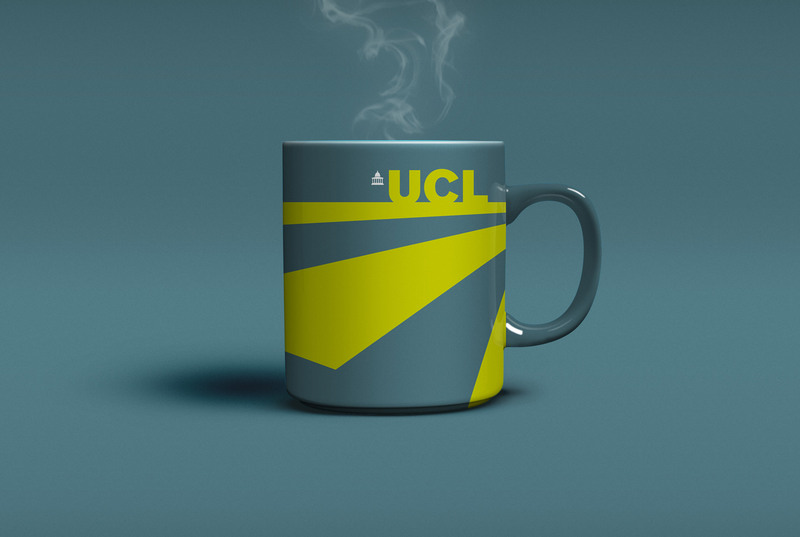 We believe UCL’s success comes from the knowledge and ideas of its people – academics and researchers, students and alumni, professional services and partners. 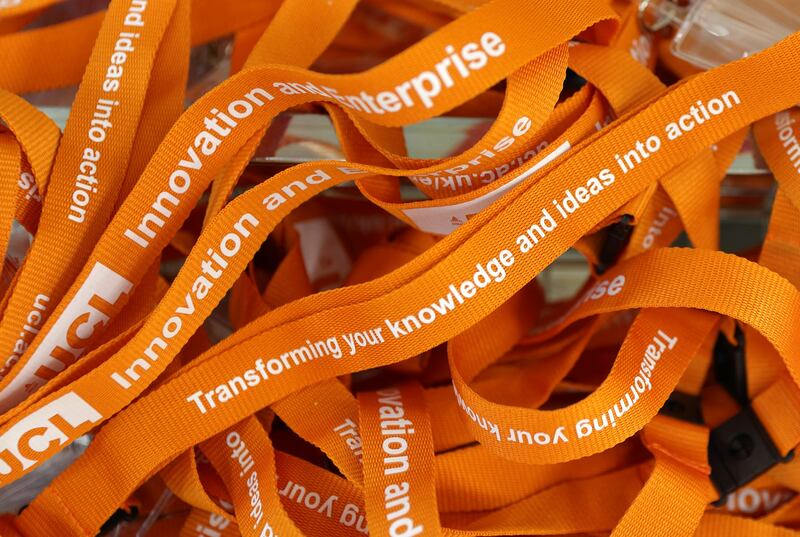 Innovation & Enterprise is here to help people across the university transform their knowledge and ideas into action. We encourage people to recognise their potential; giving them the confidence to think differently, to step out and be brave. 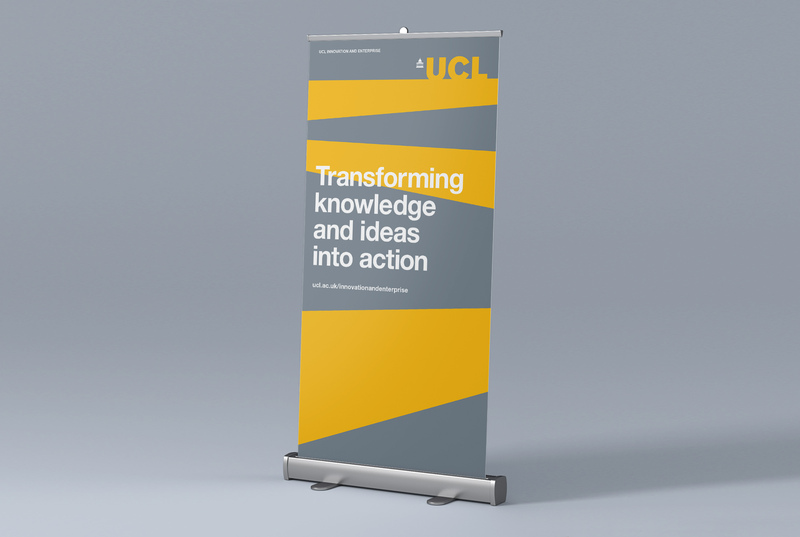 We are here to help share more of UCL’s knowledge and understanding, in new ways and with wider communities both within and beyond the university. 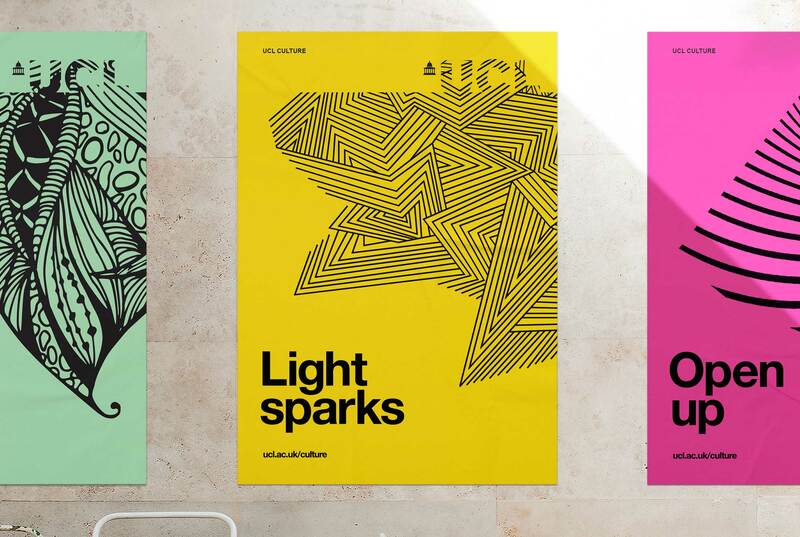 We are here to unleash more of UCL’s ideas and discoveries and put them to work in the real world. 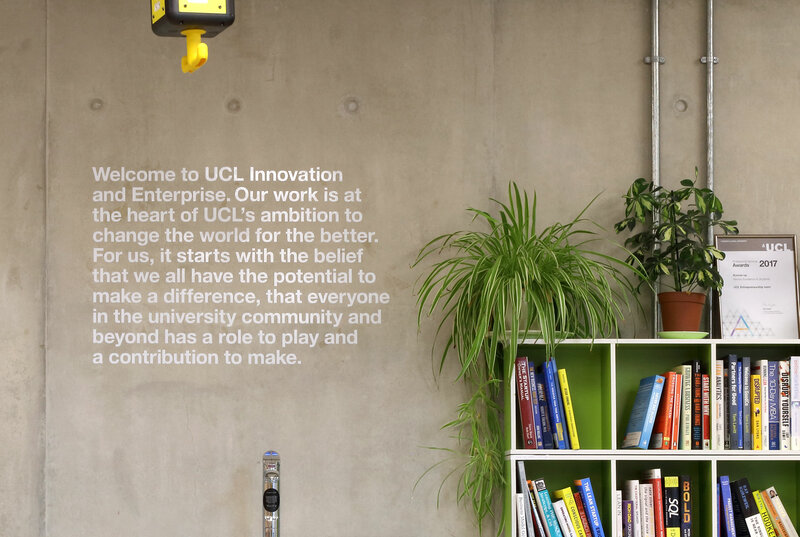 We believe the world needs UCL’s unique point of view and attitude to life. Our community has the talent and the ambition and it’s up to us, in Innovation and Enterprise, to make it as easy as possible for people to take that first step, to make the leap and turn their knowledge and ideas into action. 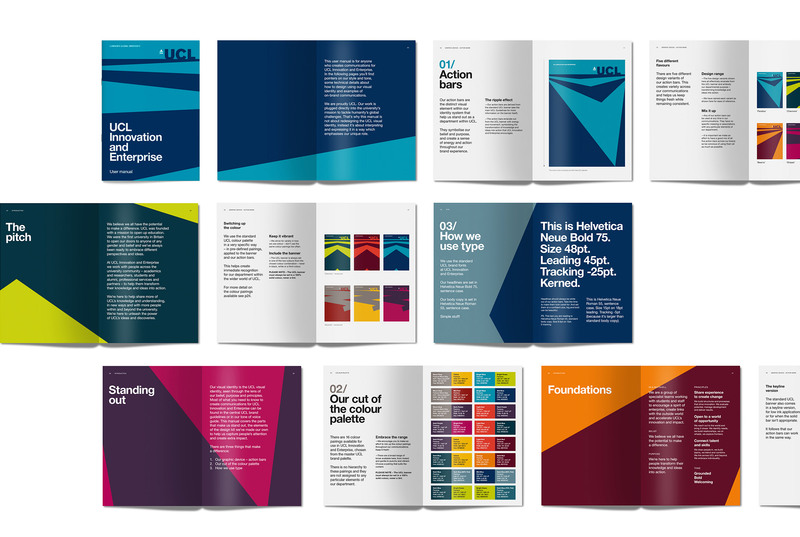 We needed to express the positioning using the established UCL parent identity, which is built primarily around a logo bar that frames all communications. 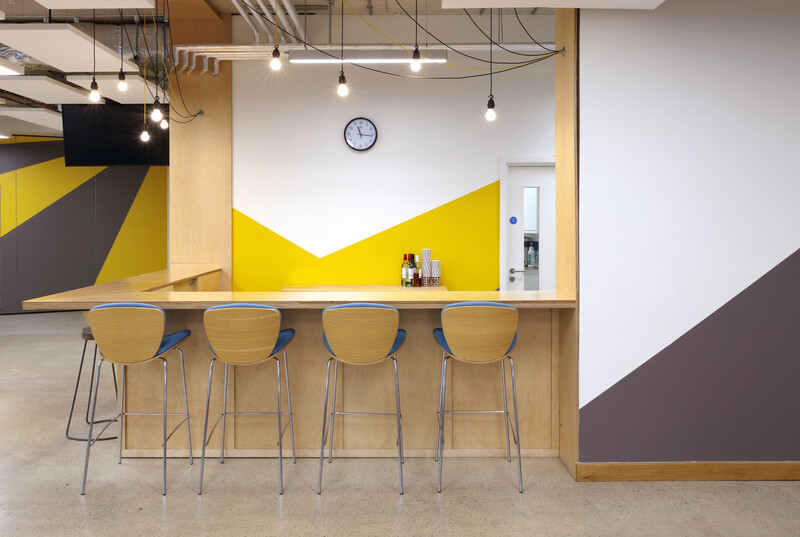 We transformed the logo bar into a symbolic source of energy and activation, harnessing UCL's wide colour palette to create a series of two colour ‘action bars’ with different dynamic shapes that burst out from the logo. 16 vibrant colour pairings were defined giving the system lots of flexibility and variety. We launched the new brand with a programme of engagement that included a series of interventions and workshops with the internal teams. 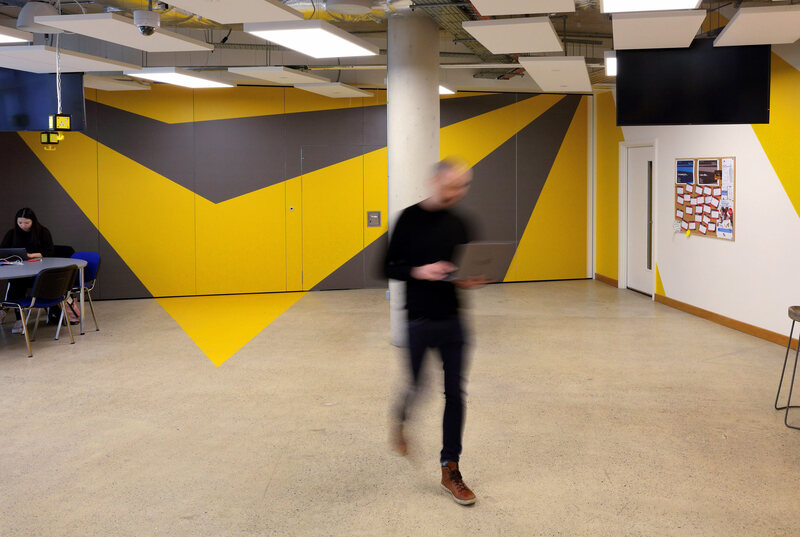 A launch event was held at Base KX, their event space and start-up hatchery. This vibrant spot was the ideal place to showcase the visual identity for the first time. 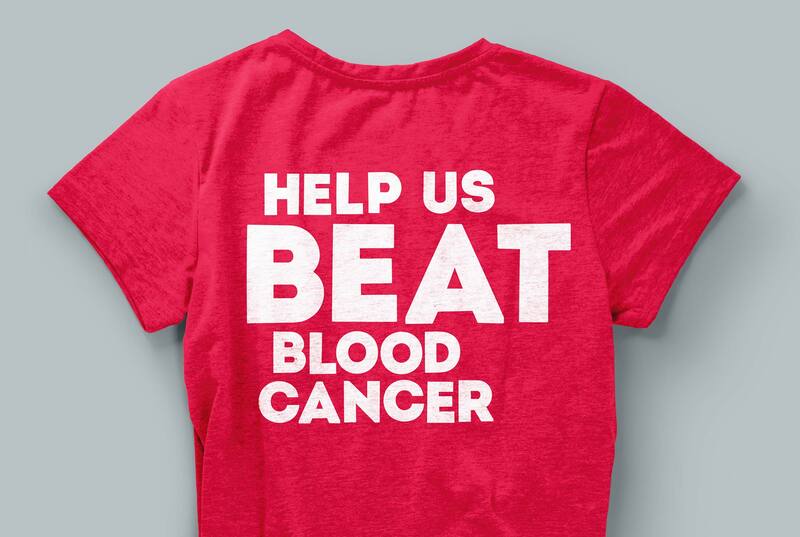 Positioning, naming, identity and organisational culture for the country's biggest blood cancer charity.